The hottest and most anticipated events for TIFF’08 was the eTalk Festival Party taking place at the Much Music Headquarters. An endless cast of stars plus a performance by P. Diddy (aka Puff Daddy aka Sean Combs) with DJ duties for the night handled by Samantha Ronson (SamRo) supported by her partner Lindsay Lohan (LiLo)! To hype the event to Faze’s national audience eTalk teamed up with us on a contest to bring four lucky ladies (and their BFFs) to the big night in Toronto. A ton of entries but only four were chosen…a big congratulations to Hilary S. (Toronto), Erika (Brampton), Cynthia S. (North York) and Shelby M. (Newmarket). After getting the tickets/wristbands to the winners, some at the Faze offices (see rooftop patio pic above) and some in the MuchMusic parking lot (see pic) we assembled the Faze team and headed to the red carpet and the rest of the fun that awaited inside. The screaming crowd impatiently waited to catch a glimpse of all the celebrities along with a high-energy performance by Hip Hop mogul P. Diddy. Diddy hit us with a few old tracks like “Bad Boy for Life” and “I’ll Be Missing You” – oh the memories – as well as a few recent favourites such as “Last Night” off of Diddy’s Press Play album (Dawn Richard from Danity Kane filled in for Keyshia Cole). Although Diddy’s performance was short, fans in and around the Much Music HQ were not left disappointed as a whole slew of celebrities poured onto the Red Carpet posing for pictures and stopping for short interviewing opportunities. The celebrities in attendance included: Sophia Bush, Kreesha Turner, Sir Richard Branson, Lindsay Lohan, Dan & Dean Caten of DSquared, Jake Gold, Chantal Kreviazuk, Kardinal Offishall, Kelly Carlson and many more. The Faze Team and friends ready to schmooze! Karmen and Lorraine posing for the photographers. Meanwhile out amongst the paparazzi, one of our favourite Faze interns Lindsay Robb with resident Faze stylist Carolee Custus (who picked out Lorraine’s dress at Designs by Naomi). We love you gals. On the etalk Festival Party Red Carpet. Divine Brown – look out for Divine in Issue #30 of Faze! The star with the biggest personality in the room, the loveable, the hilarious Jully Black! 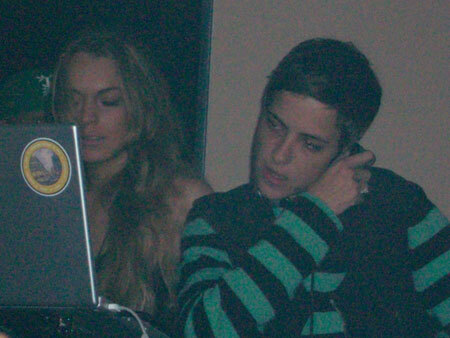 DJ Samantha Ronson started off her set with “Paper Planes” by M.I.A. Paul and Peter dashed upstairs to catch a last glimpse of Lilo and SamRo in action. Sarah is nowhere to be found. In the true spirit of TIFF week end up making it to both the eTalk Afterparty at This is London ANDDDDD the Virgin afterparty at Muzik! Editor’s Note: Found this pic, had to add on…a shot of Karmen and Sarah back at the Faze offices before the night started getting ready. Reminded us of how often the office turned into a change room, with clothes, make-up and hair product everywhere as we prepped for meetings and events! Ah, the memories.